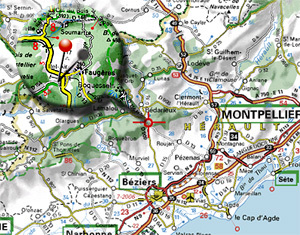 If you follow the highway A9, you follow the direction “Beziers-Centre”. You now leave the highway A9, and by taking the highway junction A9/A75, you arrive to the exit “Beziers-Centre”. Directly after you left the highway, by this exit, you follow the direction “Béziers-Centre” until you find the direction “Bédarieux”. From this moment on you keep following the direction “Bedarieux”, for about 20 miles. You are now on the D909. When you reach “Faugères”, you take the exit “Faugères”. At the end of the exit (+/-100m) you turn to the left. Direction “Caussiniojouls” The first house on your left hand side is your destination.